While I have enjoyed using essential oil diffusers in the past, I am yet to come across one that performs better than the best aromatherapy diffuser from Innogear. The cool sounding name might give you a clue as to why this product is selling so well on Amazon, but it is the performance that made me decide to write this review. Even if you find yourself with a powerful essential oil brand it is the diffuser that will output the aromatherapy benefits into your living space. Before I get to the merits of using this diffuser from Innogear, let me give you a clue as to how I got my own unit. One of the top managers at Innogear reached out to us through our contact page asking if we’ll consider reviewing one of their premier products. We get dozens of inquiries on a monthly basis, but this company is familiar to us as we did a detailed review of their 100 ML essential oil diffuser. First, we checked the feedbacks on Amazon about this diffuser and found the overall ratings to be quite good. I did convey to the person that contacted us that supplying the diffuser for free does not mean we will like its performance, which ultimately might result in an unfavorable review. To make a long story short, he agreed to accept our honest review after a few days of testing the product. 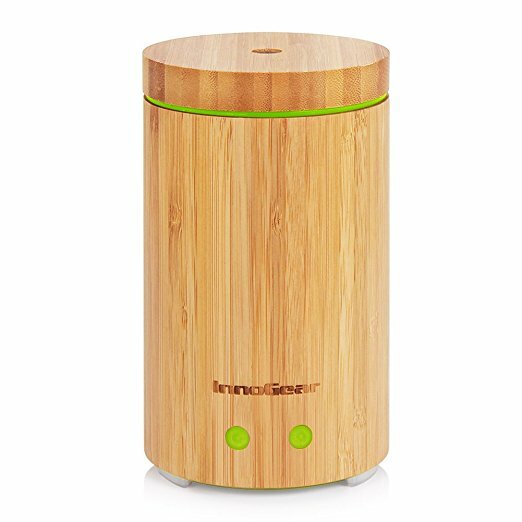 The review of the Innogear real bamboo diffuser took several weeks to conclude as I tried to find the pros and cons of using the device on a daily basis. It was difficult to find information about this company, but through reverse engineering, the firm is probably less than a decade old. Checking their website the about us page does not provide much information as to how it came into existence and the current owners. I get a sense that all that would soon change as this outfit gets more popular. Currently, they manufacture small electronic products, solar lights, essential oil gift sets, and nine different aroma diffusers. The design is quite impressive and will not take up too much space on your computer table. It is definitely a work of art the way they curved the bamboo to make this product. I give it A+plus for originality and eye appealing design concepts. If the simplicity of the design does not make you buy one today perhaps performance metrics will convince you to make the initial investment. Right out of the box this product is ready to perform! The shipping package was lighter that I imagined and the diffuser itself is not as large as the image would convey. Getting the unit to work is quite easy, just pour a small amount of water into the container using the measuring cup. Next step is to add a few drops of your favorite essential oil and then plug the unit into an electrical outlet. It is designed to run on 110-240 voltage setting and uses about 10 watts, which is less than the power consumed by a regular light bulb. The mist outputted by this diffuser from Innogear is not warm neither is it cold, The only valid description is that the mist comes out at room temperature, which was a nice surprise, to say the least. The diffuser itself does not get hot despite many hours of operation, which means it can be used safely around kids. This unit is able to turn itself off once the water is used up, this is another great feature that guarantees a longer lifespan for the Innogear diffuser. The mist outputted by this unit is not the type that will create condensation problems or wetness on the surface where it is placed. The mist that comes out is steady and before you know it, your entire living quarters will be filled with the aromatherapy properties of your favorite essential oil. While I have mostly good things to say about this product, I did find a few areas where the manufacturer can make improvements. The cons should not deter anyone looking to buy a top aromatherapy diffuser from pushing the buy now button for this product. An impressive design that will complement any modern decor you might have going inside your living space. The many different lighting colors that can be emitted by this diffuser will make your guest ask too many questions as to how to purchase one. The small size means it can sit next to your laptop as you surf the web or do other productive things. The mist is steady and will fill your entire living space with the properties of the essential oil within just a few minutes. The manufacturer claims that the bamboo used to make this product is free of all BPA toxins, which is a good thing for those with kids or indoor pets. While there are not that many moving parts to make this product function, the included instruction manual is not the clearest that I have seen. I fact, you would be better off setting up the unit by watching the YouTube video found below. The two small function buttons should have been labeled to specify what they can do individually. 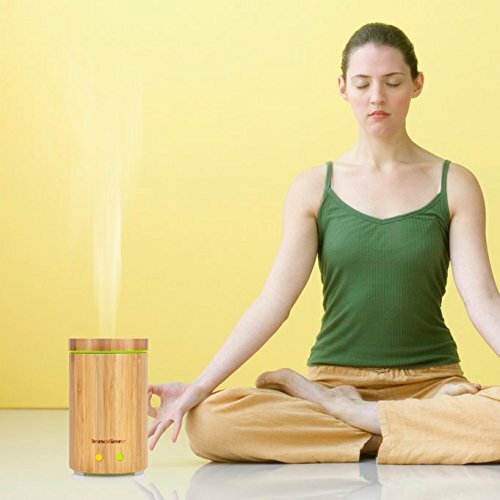 It is suggested you first read the small Innogear bamboo diffuser manual before attempting to plug in the device. The best clarity on how to use the Innogear real bamboo diffuser can be found in the video included in this review. To get the unit outputting mist, the button to your left with the two buttons facing you should be pressed once and then wait a few seconds to see what happens. The button to the right is to control the color of the light outputted and for details, you should look through the instructions manual. Initially, you should only use one full cup of water using the included measuring cup. If you find that the unit is not outputting any mist after a minute or two, you should unplug it and reduce the water level. From my test, the water level should not go past the protruding internal elements of the cover. 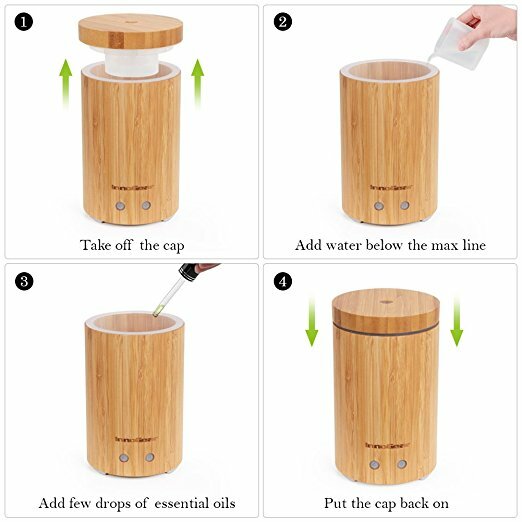 Despite the small delivery package, the following items can be found inside: the real bamboo diffuser, a plastic measuring cup, AC adapter, and a manual that covers the entire Innogear diffuser how to use steps. Is it the Best Aromatherapy Diffuser on Amazon? Despite the presence of dozens of diffuser brands online, this one comes with several advantages, which includes the ease of use and excellent design metrics. It is the ideal diffuser to use to alter the breathing air inside of your home. There is no more denying the fact that aromatherapy has many benefits and with a good essential oil and this diffuser from Innogear you can remove allergy causing elements within your home, while also creating the best scent that could uplift your mood into that of happiness and joy.